Kaci Dalton helped residents fill sandbags on Starling Airport Road in Arnold in May 2017. Major flood events can occur with little warning, said David Maurstad, chief executive of the FEMA National Flood Insurance Program. “Where it can rain, it can flood,” he said. But some areas, including the greater St. Louis region, may be hit especially hard this year. The National Oceanic and Atmospheric Administration is predicting significant flooding along the Missouri, Mississippi and Illinois rivers this spring due to snowmelt. The Mississippi River near St. Louis has a more than 60 percent chance of major flooding in the next three months, according to NOAA meteorologists. Extreme rainstorms are also expected to become more common as the climate warms — in part because a warmer atmosphere can hold more moisture. FEMA only provides individual assistance if the president declares a disaster, but Maurstad said people often mistakenly believe the agency can offer help during all flood events. To protect against flood-related damage, FEMA is encouraging property owners and renters in the St. Louis region to enroll in the National Flood Insurance Program. As part of the program, FEMA partners with dozens of private-insurance companies to offer flood coverage in specific areas. Because rates are set by the U.S. government, they do not differ from company to company. To qualify for the program, communities must adopt local floodplain-management ordinances — which limit future development in flood-prone areas. More than 22,300 communities in the U.S. participate in the program, including many in St. Louis, St. Charles and Jefferson counties. A complete list of participating cities in Illinois can be found here. 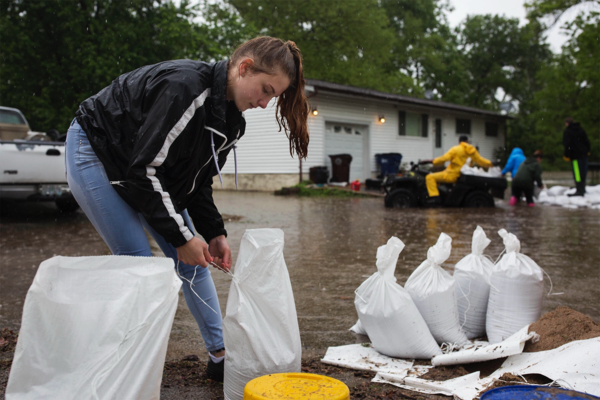 Maurstad said the flood-insurance program reduces “disaster suffering,” but it’s up to residents to be proactive about protecting their property.